As previously noted, when Ben and I co-founded MerchantCircle three years ago, we were met head on with typical skepticism...."You know nothing about media and local....or the Internet." "Look at all the dead bodies pursuing the holy grail of getting to small small businesses...How can you possibly succeed without building an audience first?" "You guys are naive and crazy....but, possibly, if it all works, brilliant!" Boy, starting up is hard work, especially when your greatest supporters -- your friends -- aren't so supportive. 350,000 merchants registered on MerchantCircle later, we're still plugging away on our "March to Millions of Merchants." We want them all -- we want all local businesses to know and use MerchantCircle as their partner in online advertising. What Google is to search, what Starbucks is to coffee, we want to be to online advertising for local businesses. Or course, there is still a ways to go. True victory is far from guaranteed. But, we're on a great trajectory. "I live in a farming community, where's there's a recession, not a lot of revenue and the local traffic has died off.... MerchantCircle has allowed me to keep my store going with the help of customers outside of Archer who want to buy my handmade soaps." "This has been such a fantastic service for my business. It not only allows me to promote my business, but get to know, help, and be helped by other reputable businesses. I love that your goal has been to keep small businesses thriving. We are enjoying the service, and having fun doing it through Merchant Circle." You guys rock!" "I love MerchantCircle! I go to San Diego Chamber of Commerce events and all the MerchantCircle members gather around and give each other high fives. We all love the site. It's like we're in a cult. I don't tell anyone else in the printing business about it because I don't want them to find out how I'm getting new customers!" Sometimes we ask ourselves if these comments are real. (They are.) We couldn't write such good stuff. Sometimes they sound like those endorsements on a late night television infomercial where there's always the disclaimer of "Actors compensated for their opinions." But these are all real. That all feels pretty good. Maybe we're no longer so "Naive." I'll accept that we're still "Crazy." Hopefully, we're headed towards "Brilliance." Along the way, I'm glad we're making the lives of local businesses better. 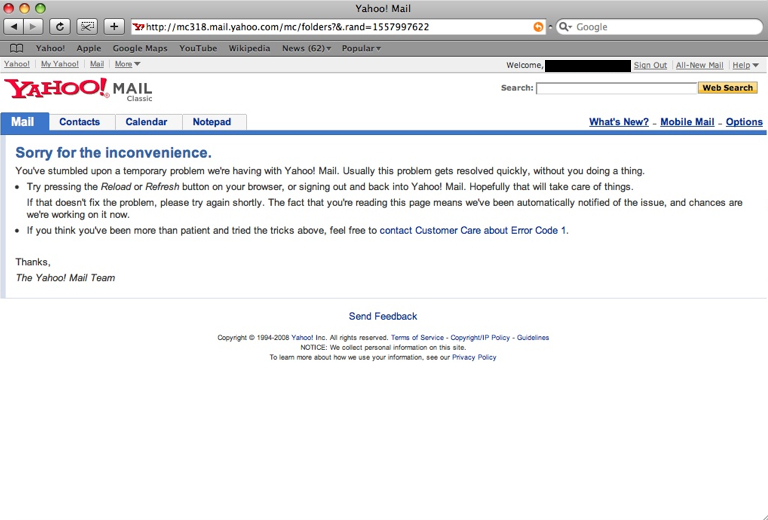 With increasing frequency (say, a few times a week), I'm finding Yahoo!Mail temporarily down. Either the site doesn't respond or I get the ever helpful "Error Code 1" or "Error Code 5." And of course, "contacting Customer Care" is a futile trip into a black hole. Is it me or is this a systemic issue revealing technical/scalability/reliability cracks in Yahoo!? Executive shuffles, re-focusing the company, layoffs -- maybe these things will get Yahoo! on track again. However, even though I've been a loyal customer for over 10 years, I'll still jump ship if they can't keep the applications running. I'm guessing I'm not alone. And, to state the obvious, It's all downhill if Yahoo! can't keep audience/page views/engagement. Is it just me -- or are you too finding Yahoo!Mail increasingly unreliable and flakey?